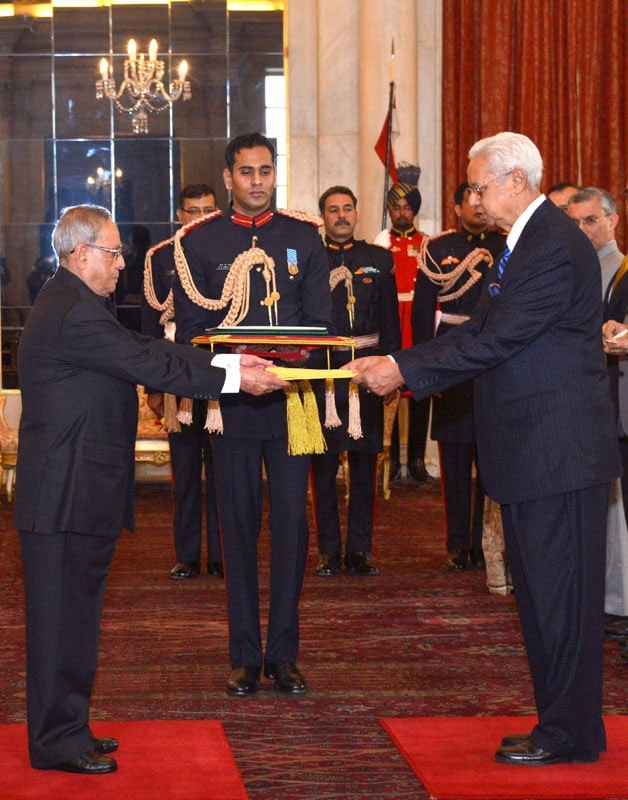 The High Commissioner-Designate of Bangladesh, Mr. Syed Muazzem Ali presenting his credential to the President, Shri Pranab Mukherjee, at Rashtrapati Bhavan, in New Delhi on December 09, 2014. The Ambassador-Designate of Kazakhstan, Mr. Bulat Sergazyuly Sarsenbayev presenting his credential to the President, Shri Pranab Mukherjee, at Rashtrapati Bhavan, in New Delhi on December 09, 2014. 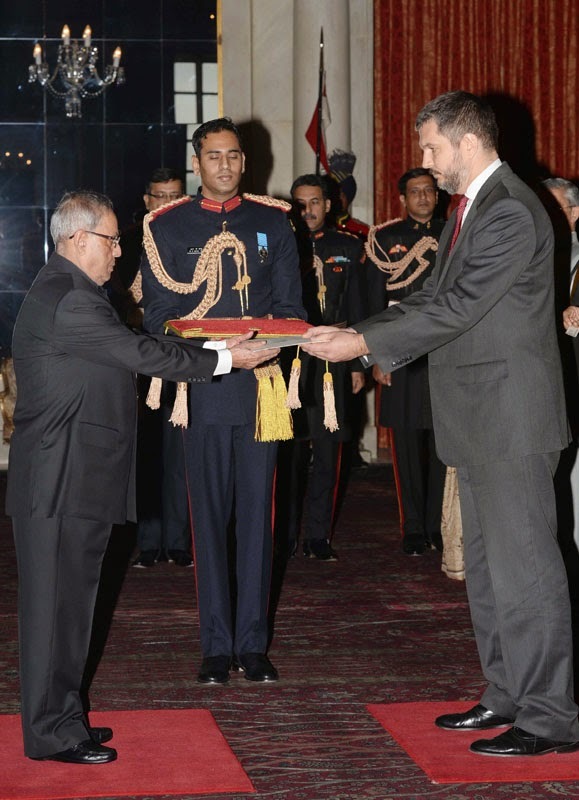 The Ambassador-Designate of Hungary, Mr. Szilveszter Bus presenting his credential to the President, Shri Pranab Mukherjee, at Rashtrapati Bhavan, in New Delhi on December 09, 2014. 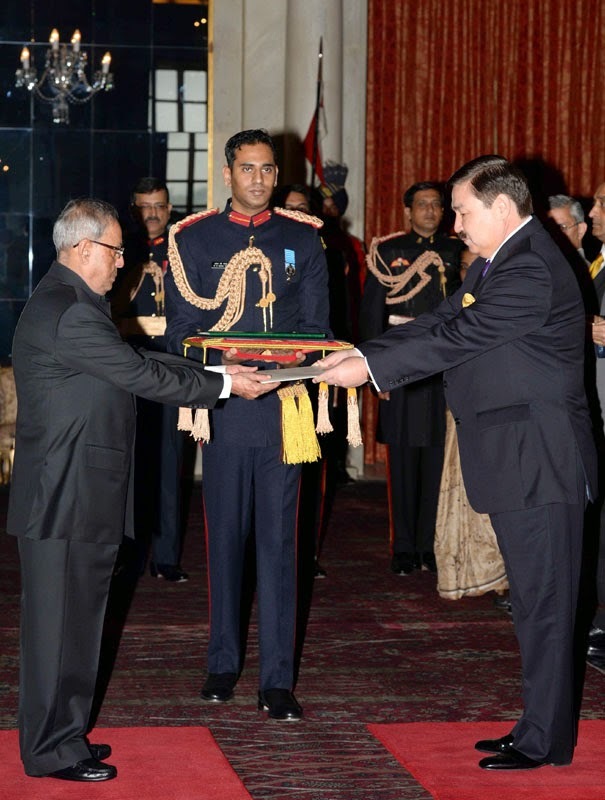 The Ambassador-Designate of Egypt, Mr. Hatem El Sayed Tageldin presenting his credential to the President, Shri Pranab Mukherjee, at Rashtrapati Bhavan, in New Delhi on December 09, 2014. 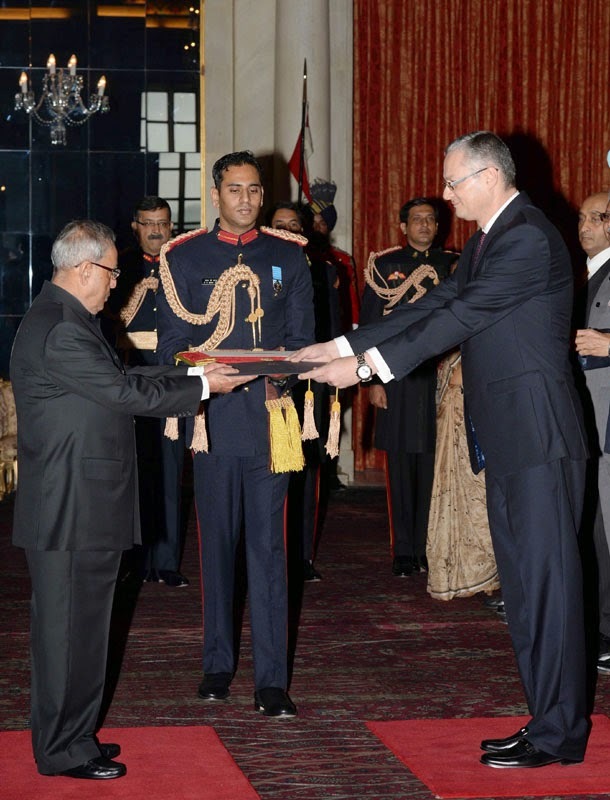 The Ambassador-Designate of Serbia, Mr. Vladimir Maric presenting his credential to the President, Shri Pranab Mukherjee, at Rashtrapati Bhavan, in New Delhi on December 09, 2014. 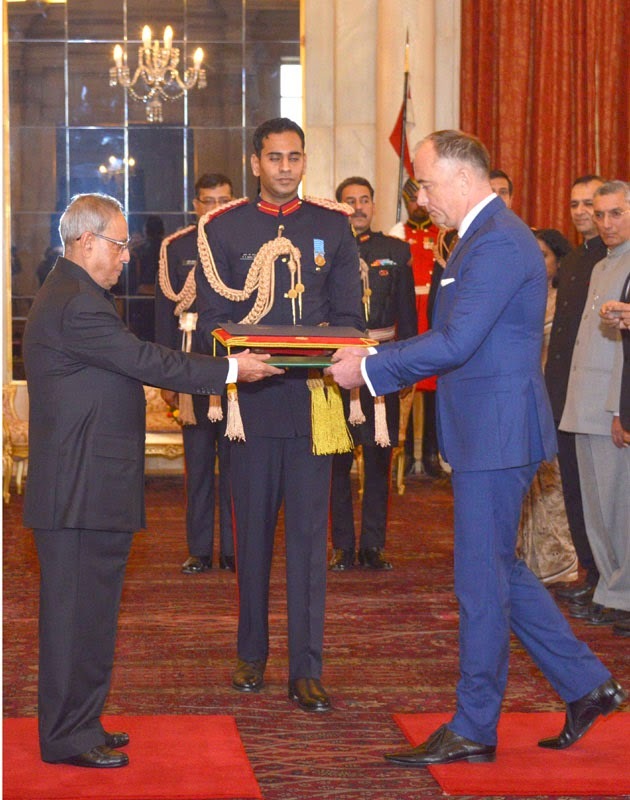 Envoys of Serbia, Egypt, Hungary, Kazakhstan and Bangladesh presented their credentials to the President of India, Shri Pranab Mukherjee at a ceremony held in Rashtrapati Bhavan today (December 9, 2014). An Electronic Art Catalogue titled ‘Art Heritage of Rashtrapati Bhavan: A Selection’ will be unveiled on the website www.presidentofindia.nic.in on December 11, 2014 by the President of India, Shri Pranab Mukherjee. Rashtrapati Bhavan is opening to people from across the world for the first time a cross section of the entire art collection of Rashtrapati Bhavan. This Catalogue will contain over 113 high quality photographs of paintings and select art objects in the collection of Rashtrapati Bhavan. Very few people in India and abroad are aware of the rich repository of art available within Rashtrapati Bhavan. Visitors to the Rashtrapati Bhavan are able to see only a limited part of the entire collection. Moreover, the location of the paintings, lighting, distance from the viewers etc. makes it difficult for casual visitors to study and fully appreciate the paintings. It will also enable viewers enlarge the paintings as well as zoom in to see the details in a manner far superior to viewing with the naked eye. The catalogue is user friendly and designed to look like a photo album, with photos of the paintings on the left page and a description of the item, background of the artist as well as the subject of the painting on the right side. Viewers can browse through the catalogue by category or by location. The E-Art Catalogue has been researched and compiled by Mr. Venu Rajamony, Press Secretary to the President with the assistance of Ms. Ruchi Kumar, Research Assistant/ Assistant Curator, National Gallery of Modern Art. Dr Jitendra Singh, Union Minister of State (Independent Charge) for Ministry of Development of North Eastern Region (DoNER), MoS in PMO, Personnel, Public Grievances & Pensions, Atomic Energy and Space, today convened a meeting of the Ministry of DoNER to prepare a comprehensive development plan for trade and tourism in North Eastern Region during the next year and informed that the Centre has approved 2-laning and 4-laning of 6,418 km of various categories of roads under Phase `A` and Arunachal package of “Special Accelerated Road Development Programme in North East” (SARDP-NE) in entire Northeast at an estimated investment of Rs.33,500 crore. Addressing officers of the Ministry of DoNER, Dr Jitendra Singh said that the eight North Eastern States are like eight “sisters” but Ministry’s responsibility is to ensure that all these eight sister- States receive their equitable share so that they can live in harmony without grudging against each other. At the same time, Ministry’s responsibility is also to ensure that these eight sisters consider themselves as “real” sisters and not “cousin” sisters of rest of the 21 States and 7 UTs outside North East, he added. In other words, Dr Jitendra Singh said, the prime objective of the DoNER Ministry is development of North East at par with the rest of the country in order to ensure, as Prime Minister Narendra Modi says, that the right arm (East) of Mother India should not find itself weak or feeble as compared to left arm (West). Issuing instructions for immediately expediting all the pending projects of the North-Eastern Region, Dr Jitendra Singh told the officials that the message must go out to all the eight Chief Ministers and 39 MPs from North East that the DoNER Ministry is here to act as a “facilitator” and not as an arbitrator. In order to achieve this, the DoNER Ministry, instead of issuing any diktats or imposing any preferences, should rather try to understand the aspirations, preferences and priorities of each of the eight States and do the necessary liaisoning from the union capital. Dr Jitendra Singh also pointed out that as the North Eastern Region has set an example of gradually limping back from insurgency to resurgence, the Government of India’s focus in the next few years will be to promote trade and tourism potential of the area which would not only raise the economic standards of the region but also inspire the rest of the country to look East for business and tourism.